1. Mix the marinade ingredients together and use to cover the pork and sliced peppers. 2. Allow to marinade for as long as possible, at least 2 hours, stored in the fridge. 3. 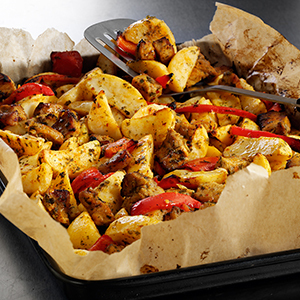 Stir in the frozen McCain Chef Solutions Simply Wedges and roast on a large baking tray, which has been lined with greaseproof paper. 5. Serve with a yoghurt dip and fresh salad. This dish slightly steams the potato which picks up a lovely lemony flavour but a little care is needed when serving to ensure the wedges do not break up too much.